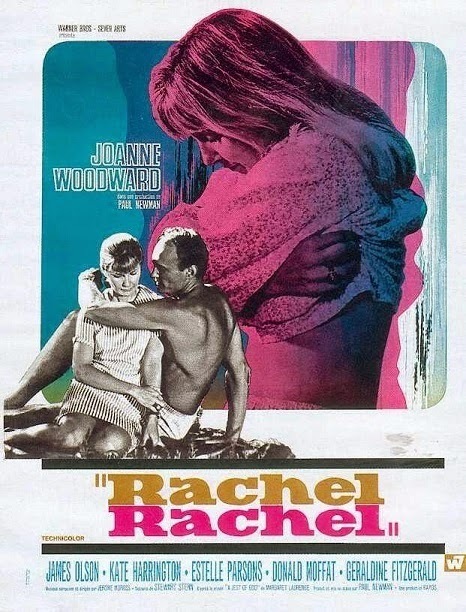 Rachel, Rachel is hardly ever discussed nowadays, but it was a hit back in 1968, spending three weeks at the top of the box office and earning four Academy Award nominations, including Best Picture. 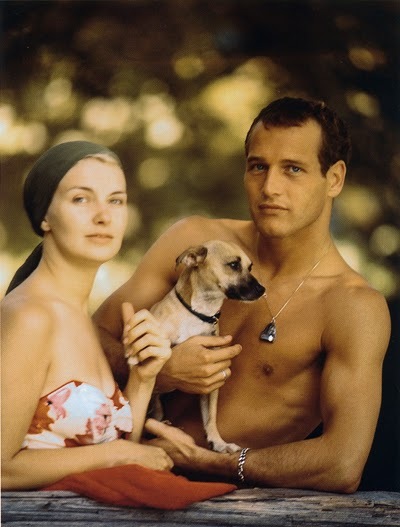 Those nominations aren’t so surprising – the film is anchored by a stunning lead performance from nominee Joanne Woodward (aka Mrs. Paul Newman) in the title role, and Stern’s excellent screenplay was duly recognized at the time by the Academy as well. But that box office is indeed a bit unexpected, and a sign of how moviegoers’ tastes have changed: Rachel, Rachel is a decidedly elliptical, understated film – “arty” would be the word tossed around today. That such a film ever connected with a mass audience is both baffling and encouraging. Unspooling initially like a rural variation on a T.S. Eliot poem, Rachel focuses on the life of a 35-year-old schoolteacher (Woodward) living with her mother in a small town, desperately yearning but unable to connect with the world around her. Rachel’s family was in the funeral business, and her film is often punctuated with flashbacks to her late mortician father going about his grim business – picking up the dead, cleaning the corpses, etc. Rachel has been surrounded by death her whole life. The family car is a hearse – a surreal symbol whose obviousness is undercut by its sheer perversity. She also has a thing for trees – a friend gives her a miniature tree as a present, and Rachel dreams of trees when she’s trying to calm down. But her real life is one of suffocating stasis. Her existence in the town of her birth is awash in memories, suggesting that she is circling around her life in an endless, despairing loop. Rachel spends time taking care of her mother, teaching her kids, dreaming of the past, and enduring flashes of what life might be like if something happened to her – anything really, be it good (running away with one of her students, saving him from careless parents), bad (dropping dead in the middle of the street), or merely exciting (an illicit affair with her married principal). She’s the Walter Mitty of mundane happenstance. Newman, Stern, and Woodward create a narrative that alternates between fevered longing and chilly entrapment. Despite her daydreams, Rachel resists connection when it comes her way. Another teacher friend Calla (Estelle Parsons) invites her to her church, a kind of hippified variation on a revival meeting. Rachel initially says no, but when she finally attends, she finds herself confronted by a charismatic preacher whose wild exhortations make her nearly suffer a breakdown. (“The animals are less alone with roaring than we are with all our words,” he yells.) Afterwards, the somewhat mousy Calla comes on to Rachel, only to be rebuffed – thus leading to a bad break with what appears to be the one friend our heroine has. Everyone, it seems, is seeking something, and one of the film’s great accomplishments is to give us the full range of human yearning, without passing much judgment on it: The church meeting, despite flashes of absurdism, isn’t treated as a frivolous affair, and Calla, for all her pathos, is one of the more sympathetic characters in the film. Rachel’s life appears on the verge of change when she meets an old school friend, Nick (James Olson), whose dead twin brother she saw her father prepare for burial as a child. Nick, in town for a brief while, also comes on to Rachel – but instead of the sudden kiss of a closeted lesbian, his are the moves of a smooth talking ladies’ man: He invites her to a movie and when she asks what’s playing, looks into her eyes and says, “What’s the difference?” The two immediately strike up a love affair, and Nick’s physicality – their first time together, he takes her into the woods, strips down, and holds her – is a stark contrast to Rachel’s buttoned-down repression. Soon enough, Nick brings her out. She spends an idyllic time at his family’s farm, bailing hay, milking cows, learning to ride a tractor, and making love. But we can also see Nick for what he is: Just an ordinary, good-looking guy out to have a good time. As Rachel allows herself to be drawn in more into this relationship, it becomes clear that her dreams are about to be dashed yet again. The manner in which Rachel’s raw, unchecked emotions come desperately flooding out as soon as she feels like she may have found somebody – “I am happy. I love you. I want a child,” she says, soon after she and Nick get together – provides a further hint to her inner life. Rachel isn’t a cold fish. Far from it; she’s a person of deep, turbulent feelings, and the script (along with Woodward's performance) makes it clear that her attempts to close herself to the world are a symptom of the shame she feels at them. In many senses, when Calla comes on to her, she becomes a mirror, or more accurately a cautionary tale, for our heroine. Rachel may not be a lesbian, but she too has dreamed of making sudden, romantic gestures like that, and the disdain with which she herself treats Calla epitomizes the scorn she fears she will endure if she ever opens up. Newman once said that his one direction for Woodward was “Pinch it.” She certainly appears to have run with that instruction. Her performance here is a clinic in closing oneself off while still allowing the audience to peek inside – how to emote without emoting. Despite his recollection of such modest direction, Newman himself was particularly adept at this kind of performance, too (check out his turn in The Long, Hot Summer), and it’s easy to see both why he was drawn to this material and why he was able to film it so well. His work here is impeccable; even though he made a few other films, I’d say Rachel, Rachel was his best one as a director. And Stern's script certainly ranks alongside his Rebel Without a Cause as a profound study of a fractured, and perhaps distinctively American, soul. Someday, the film will hopefully be better known. "Oh, hello. Did we break your concentration?" Beautiful reminder of why I love this film, still. Bravo to all involved. Woodward's performance was for more worthy of the Oscar than the ones given by Heburn, Streisand, Redgrave or Neal. Nice that this is getting a chance for rediscovery. I agree with your assessment (and would add kudos for Kate Harrington's performance as Rachel's mother). I think Newman directed only five films -- I haven't seen The Effect of Gamma Rays...or his TV adaptation of The Glass Menagerie, but Sometimes a Great Notion is decent, and I really liked the universally panned Harry & Son, which, though hindered somewhat by the presence of moony young Robby Benson, holds up quite nicely as sort of Cassavetes-lite. Newman creates a believably lived-in world, and gets great work from a diverse cast. Maybe that one's ripe for its own Forgotten Films column. Such a incredible actress. Have loved Joanne Woodward since forever! If you desperately need an honest and real death spell caster who can help you cast a perfect death spell on anyone then contact this great death spell caster called Dr Ogbeifun He saved my marriage, he helped me cast a death spell on the lady that almost took my husband completely away from me and the kids. i need to end it by killing her, and i don't want to make use of assassin because it will be risky so i needed to do it in a spiritual way that's why i decided to contact him, he assured me not to worry as i have contacted the right person at the right time, i co-operated with him and in less than 48 hours she was dead, she slept and never woke up all thanks to Dr Ogbeifun my husband is back to me. You too can try this man also..